Shiner's Brady Strauss, center, hoists the Class 1A championship trophy Friday afternoon with teammates Garet Pustka, left, and Marcus Lopez after the Comanches' 13-3 Class 1A final victory over the Follett Panthers at Dell Diamond in Round Rock. ROUND ROCK - The hit parade continued for Shiner and it struck gold in the process. The Comanches banged out 13 hits and rolled to a 13-3 win over Follett in the Class 1A state final on Friday morning at Dell Diamond in a game stopped after 4 1/2 innings because of the 10-run rule. 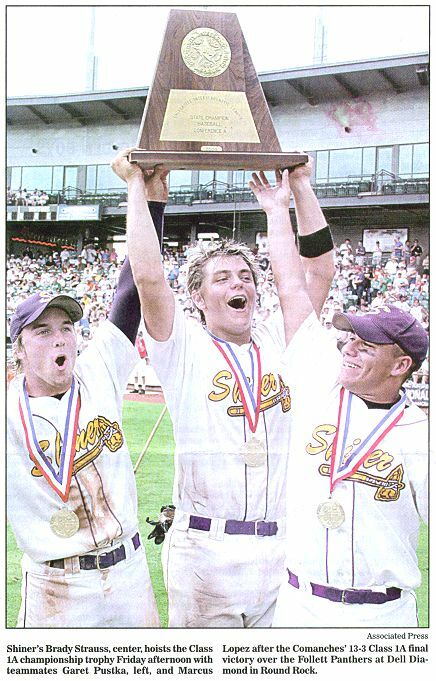 Shiner claimed its fourth state championship and second in three years with a 23-9 record. 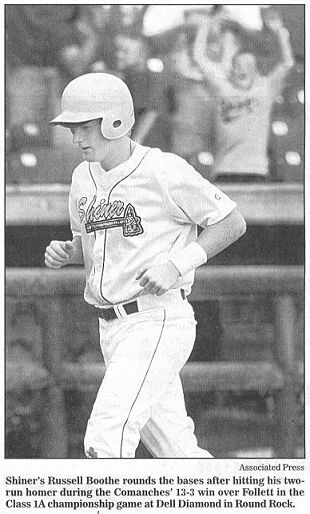 "We did a lot of waiting around, but once we got our bats going there was nothing stopping us," said Shiner center fielder Chris Baer, who had three hits, including a double, and four RBIs, and was selected as the MVP of the state championship game. "We had a good hitting day and when we have a good hitting day, there's nothing stopping us." The Comanches, who had 23 hits and hit .418 for the state tournament, overcame another rain delay and shaky defensive start by batting around twice against Follett (23-4) and scoring in every inning but the third. 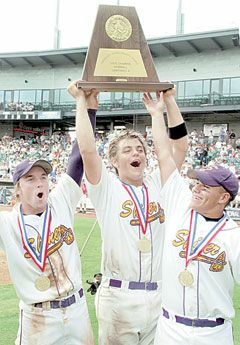 "I guess my wrap-up on the state tournament would be it's not how you start but how you finish," said Shiner coach Daniel Boedeker, who has won a state championship at Shiner as a player, assistant coach and head coach. "We had to sit around a lot and we made some defensive mistakes, but the kids hung in there and got the job done." After being rained out Wednesday and rallying for five runs in the sixth inning of Thursday's 8-7 semifinal win over Maud, the Comanches sat through a 1 1/2-hour rain delay and a 6-minute stoppage of play in the top of the first inning. Shiner got itself in a hole by committing two of its four errors after starting pitcher Scott Shimek had struck out the first two hitters. Follett had two of its four hits in the first inning and Shimek walked two batters, and the Panthers scored two runs. "Our defense definitely struggled and I think a little of that was nerves," Baer said. "But with our batting capability, I knew we could come back. Especially with what we had done in the semifinal and what we were playing for." It took Shiner only three batters in the bottom of the first inning to tie the game. Baer singled and was forced at second when he had to hold up on Garet Pustka's blooper that fell in front of center fielder Shayne Dunham. Shiner's Russell Boothe rounds the bases after hitting his two-run homer during the Comanche's 13-3 win over Follett in the Class 1A championship game at Dell Diamond in Round Rock. Russell Boothe drove Follett starter Cody Freeman's next pitch over the left-field fence for his fourth home run of the season and second of the playoffs. "Usually something big happens that changes the game," Boothe said. "I think that gave us a big boost." "The home run was definitely a big hit," Boedeker added. "It swung the momentum. I always say hitting is contagious. We got the big hit early and it started with Russell. The rest of them picked it up from there." Shiner took a 3-2 lead on a single by Shimek and a double by Jared Boedeker. But Follett came back to tie the game in the second when Freeman's double brought home its third unearned run of the game. The Comanches took control in the bottom of the inning by scoring five runs on four hits, a walk, and a Follett error. Chase O'Connor started the inning with a walk and went to third on a double by Ryan Kloesel. Jared Robertson, who pitched a one-hitter in Follett's 1-0 semifinal win over Pineland West Sabine on Wednesday, relieved Freeman, and was greeted by Baer's two-run double down the left-field line. Robertson hit Pustka with a pitch and Shiner loaded the bases when Boothe's wind-blown pop fly fell behind the infield. Baer and Pustka scored on a single by Brady Strauss and Boothe made it 8-3 when he came home on an error. "They are a tremendous hitting team," Freeman said. "From one to nine, they can all swing it." Shimek, who picked up a save in the semifinal game, allowed only one hit, which he erased with a pickoff, and one walk over the final three innings. "I was glad I got to pitch yesterday (Thursday), because that helped me get the nerves out," said Shimek, who had 10 strikeouts and finished with a four-hitter. "Once we started hitting the ball, I started to relax and just tried to throw strikes." After going down in order in the third inning, Shiner sent 10 batters to the plate in the fourth and scored five times. Pustka reached on an infield hit and went to second when the throw from Freeman at shortstop went into the dugout. Boothe was hit with a pitch and the runners moved up a base on Shimek's groundout before scoring on the fifth hit of the tournament by Strauss, who set a Class 1A state tournament record by hitting .714. Strauss was out at second on a fielder's choice grounder by Boedeker, who moved to third on a double by Dylan Hagens. O'Connor walked to load the bases and Boedeker scored on an infield single by Kloesel. Baer pushed the margin to 10 with his third hit to score Hagens and O'Connor, and three outs later, Shiner's celebration began. "I think this is a bigger one than the first (state championship)," Baer said. "Coming from behind and winning in the semifinal game was huge for us. After that game, we had a lot of confidence that we could take it all." Ryan Kloesel 2-for-3, RBI, R, 2B; Jarod Boedeker 1-for-3, 2B, RBI, run. Records: Follett 23-4, Shiner 23-9.